Valcourt (Quebec) Canada, November 2004 Wishing to get rid definitively of the traces of colonialism does not mean starting a reverse racism. The old victims of the racism of the white must remain far from the anti-white revenge racism that would lower them at the infamous level of their former exploiters. What the Africans must require is the end of colonialism in all its forms, be it cultural, religious or economic. It is not the race that is in question, it is the citizenship. That French emigrants became a great part of the African economy and can continue to live on this continent while contributing to its development, is an excellent thing. What is unacceptable, it is that these people grow rich on the back by the Africans and then leave to benefit from their fortune in their countries of origin and are used at the same time as excuse for the military interventions of the old colonial powers. The emigrants of the old exploiters countries must choose between the nationality of their new country and the old one. Just like Japan, the African countries must require that people who live on their lands choose the nationality of the countries where they get rich and which they enrich at the same time. As a long as there will be French citizens in Ivory Coast, the French government will seize the least occasion to send its armies under the fallacious pretext of protecting its citizens. (…) Being anti-French for Africans is normal, but they should never become anti-white!Wanting to expel all the French is healthy, because neo-colonizers don’t have anything to do in independent countries and would recover their dignity, but to want to expel the White, only because of their color of skin, is a racist crime that would sully the Africans who have the privilege of having a moral purity that is missing to the former colonizers. 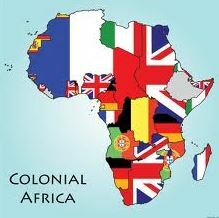 A convalescent Africa of decolonization must not confuse the fight against the after-effects of colonization and racism. Forcing all people of French nationality who claim to like African Countries that welcome them to adopt the nationality of these countries and definitively be deposed of their French citizenship, which is called legally a renouncement of the links of allegiance, would be a tangible proof that these citizens are sincerely attached to the country where they work. And it would be especially a guarantee that the old colonial powers could not use this false pretext any more to send their armies. "Africa to the Africans", more than ever, this leitmotiv must be repeated "Africa to the Africans", i.e. to those who chose to be citizens and to contribute to its development, whatever their colour of skin. The others, the plunderers who only come to get rich on the backs of the Africans, and whatever their colour of skin also, must leave, even if they are American Blacks. Not only, because in fact they are plunderers who don’t really like really Africa, but also because they are a too easy alibi for military interventions of the old colonial powers. "Africa to Africans'" is an admirable and motivating leitmotiv. It is necessary to be extremely vigilant so that this splendid leitmotiv never becomes "Africa to the Blacks"... That would be a crime, not only against Humanity, but especially against the black race itself that a great African thinker called the “negritude”, and who has the honor and the privilege of having the superiority on the White, of never having committed the crime of colonizing the European populations or of having subjected them to disgusting slavery. Africa must preserve this moral superiority so that never the former colonizers could, by feeling victims in their turn of the racism of the Blacks, feel released from their eternal moral responsibility for their past crimes. "Africa to the Africans", it is a leitmotiv filled with enthusiasm for the most important Continent for the future of Humanity, this Continent that will be inhabited by people of all races having chosen freely to be its citizens and contribute to his blooming and whose children, resulting from racial mixtures, will be the most beautiful and most intelligent of the planet, thanks precisely to this genetic mixing."